Synopsis: In this notorious Nazi propaganda historical costume melodrama, a conniving, ambitious Jewish businessman, Süss Oppenheimer, snares a post as treasurer to the Duke of Württemberg by showering the corrupt duke with treasure and promises of even greater riches. In the German region of Wurttemburg in 1733, the new Duke, Karl Alexander (Heinrich George), swears to follow the traditional code of ‘loyalty and honesty.’ But the Duke, a lover of the good life, quickly becomes frustrated by his council’s refusal to provide him with funds for an opera and ballet companies and a personal bodyguard. It also becomes apparent that the Duke’s oath to follow the code to which he swore is dependent upon the quality of the lifestyle he enjoys, so that when his requests are refused he sends his courtier to the Jewish financier Joseph Süss Oppenheimer (Ferdinand Marian) in Frankfurt. Identifying an opportunity to insinuate himself into the Duke’s affairs, Oppenheimer agrees to lend the Duke the finances on condition that he personally presents the jewels he requires, even though Jews are banned from entering Stuttgart. So begins Oppenheimer’s campaign to not only secure a position of wealth and power for himself but to gradually enable all Jews to enter and reside in the city. Altering his appearance to appear more gentile, he becomes a trusted confidante of the Duke, who nevertheless continues to look down upon him because of his origins. When Oppenheimer offers to write off the debt in return for control and maintenance of the City’s roads the Duke is quick to agree. Almost immediately, Oppenheimer installs numerous tolls on the roads, which results in traders raising their prices to cover the increased costs. As the Duke receives a share of these proceeds, it’s not long before Oppenheimer is imposing oppressive taxes on salt, beer, wine and wheat. One possession Oppenheimer is unable to secure for himself is the lovely young Dorothea Sturm (Kristina Söderbaum), daughter of the council chairman (Eugen Klöpfer) and fiance of Faber (Malte Jaeger). 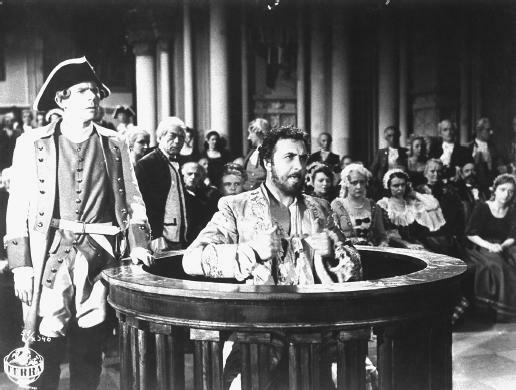 When her father hurriedly arranges his Dorothea’s marriage to Faber, Oppenheimer angrily responds by having him imprisoned for conspiracy against the Duke. Veit Harlan’s Jew Süss has to be one of — if not the — most notorious films in the history of cinema. Made partly as an anti-Semitic response to the 1934 British version of the same story, which painted Oppenheimer (portrayed in that film by exiled German actor Conrad Veidt) in a positive light, the Nazi version showed Jews in a stereotypically negative one. To a man they are all portrayed as greedy, grasping and manipulative. When a Rabbi (Werner Krauss) suggests that Oppenheimer will not lend money to the Duke’s courtier, a greasy-looking Jewish trader belligerently states that, like all Jews, Oppenheimer will lend the money and jewels so that he can later ‘take, take, take!’ It’s a statement that is proven correct as he insidiously strengthens his control of the City of Stuttgart. Watching Jew Süss is something of a strange experience. Seeing Nazi ideology spouted through the mouths of kindly father figures or wholesome youths suffering beneath the oppression of Jewish intrusion sometimes makes it easy to forget that those being oppressed and persecuted are, in truth, the bad guys. It’s human nature to sympathise with those who are being victimised and to despise their victimisers, and it therefore takes a conscious effort to view the film with an objective eye. The film was hugely popular in Germany upon its release, and the impression it must have made on a population that swallowed its lies must have been immense. But then, our condemnation of a government that sanctions such obnoxious propaganda has to be tempered by the realisation that there probably isn’t a government in the world that hasn’t followed the practice to some degree — or at least allowed it to take place. D. W. Griffith’s Birth of a Nation (1915) for example, one of the most famous and influential movies in cinema’s history, is equally guilty of the moral crimes perpetrated by the film Jew Süss. But what of the film itself? Well, perhaps surprisingly, Jew Süss is an extremely well-made film, filled with excellent performances. Although he later claimed to have been coerced into accepting the role, Ferdinand Marian appears to be having a whale of a time as Oppenheimer, spinning a Machiavellian web of intrigue as he worms his way into a position of power. By turns charming, unctuous and oily, his character thrives on an atmosphere of plots and stratagems. Heinrich George also stands out as the weak and greedy Duke, who knows he is being manipulated but enjoys the fruits of such manipulation too much to do anything about it. The plot races along, never dragging despite the politics at its core, and Harlan’s direction shows that his was a talent that would not have been out of place in the studios of Hollywood. After the war, the authorities tried to have every copy of Jew Süss destroyed. The reasons are understandable — it’s a pernicious, hate-filled racist tract to which no right-thinking individual or nation could possibly adhere. But, as such, it also serves as a valuable historical document. The fact that the circumstances under which such a film could be made even existed, if only for a brief period of time, is remarkable. The fact that its message is still so powerful provides us with an insight into just how an entire nation could become so enthralled by the Nazi ideology that it permitted the atrocities committed by that regime to happen.